These articles are scanned and OCRed from old editions of the The Electrical Experimenter, yet another of Hugo Gernsback. 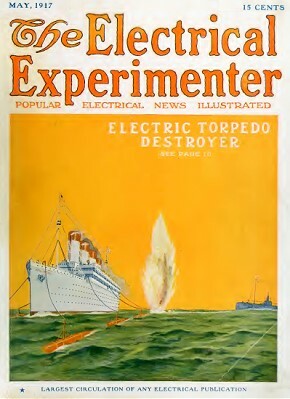 Here is a list of the The Electrical Experimenter articles I have already posted. All copyrights are hereby acknowledged. Amateur radio station operators seemed to always be amongst the first to lose their rights in time of war. Governmental power brokers - from unelected local bureaucrats on up to presidents - love to demonstrate their influence over citizens when the opportunity arises. 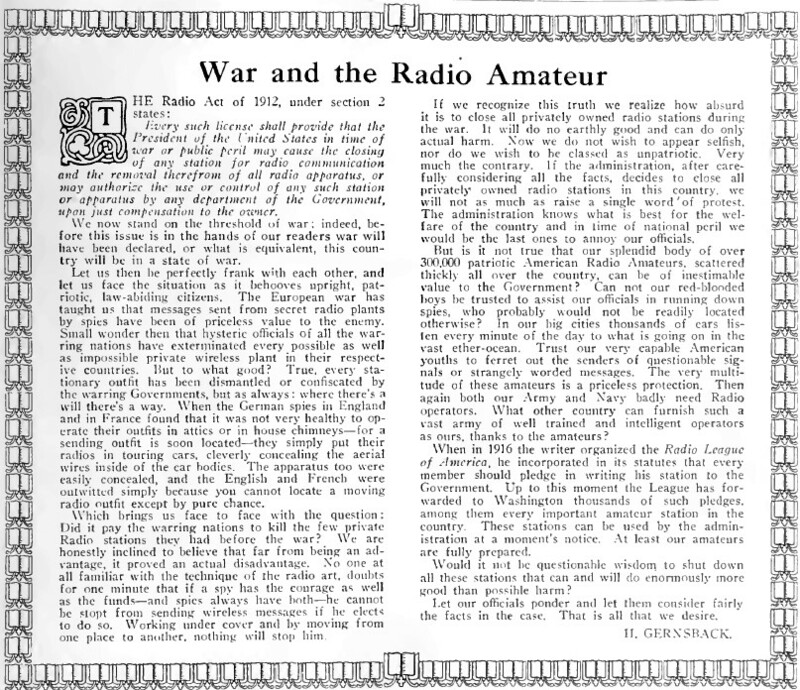 The Radio Act of 1912 revoked the rights of amateur radio stations to operate, and in some cases authorized the confiscation of radio equipment for use by the government. Permission was not restored until 1919, after World War I. Amateurs took it on the chin again in World War II with revocation of licenses. In this 1917 article in The Electrical Experimenter publisher Hugo Gernsback makes the case for permitting "our red-blooded boys be trusted to assist our officials in running down spies." "...we realize how absurd it is to close all privately owned radio stations during the war," says he. It fell on deaf ears, as usual. As the now mayor of Chicago once famously said, "You never want a serious crisis to go to waste. But what I mean by that, it's an opportunity to do things you think that you could not do before." See "Marconi Station Seized by Daniels;" Wireless Co. Decides to Offer No Resistance to Closing of Siasconset Plant. Makes Quick Backdown, The New York Times, September 26, 1914. Every such license shall provide that the President of the United States in time of war or public peril may cause the closing of any station for radio communication and the removal therefrom of all radio apparatus, or may authorize the use or control of any such station or apparatus by any department of the Government, upon just compensation to the owner. We now stand on the threshold of war; indeed, before this issue is in the hands of our readers war will have been declared, or what is equivalent, this country will be in a state of war. Let us then be perfectly frank with each other, and let us face the situation as it behooves upright, patriotic, law-abiding citizens. The European war has taught us that messages sent from secret radio plants by spies have been of priceless value to the enemy. Small wonder then that hysteric officials of all the warring nations have exterminated every possible as well as impossible private wireless plant in their respective countries. But to what good? True, every stationary outfit has been dismantled or confiscated by the warring Governments, but as always: where there's a will there's a way. When the German spies in England and in France found that it was not very healthy to operate their outfits in attics or in house chimneys - for a sending outfit is soon located - they simply put their radios in touring cars, cleverly concealing the aerial wires inside of the car bodies. The apparatus too were easily concealed, and the English and French were outwitted simply because you cannot locate a moving radio outfit except by pure chance. Which brings us face to face with the question: Did it pay the warring nations to kill the few private Radio stations they had before the war? We are honestly inclined to believe that far from being an advantage, it proved an actual disadvantage. No one at all familiar with the technique of the radio art, doubts for one minute that if a spy has the courage as well as the funds—and spies always have both—he cannot be stopt[sic] from sending wireless messages if he elects to do so. Working under cover and by moving from one place to another, nothing will stop him. If we recognize this truth we realize how absurd it is to close all privately owned radio stations during the war. It will do no earthly good and can do only actual harm. Now we do not wish to appear selfish, nor do we wish to be classed as unpatriotic. Very much the contrary. If the administration, after carefully considering all the facts, decides to close all privately owned radio stations in this country, we will not as much as raise a single word of protest. The administration knows what is best for the welfare of the country and in time of national peril we would be the last ones to annoy our officials. But is it not true that our splendid body of over 300,000 patriotic American Radio Amateurs, scattered thickly all over the country, can be of inestimable value to the Government? Can not our red-blooded boys be trusted to assist our officials in running down spies, who probably would not be readily located otherwise? In our big cities thousands of ears listen every minute of the day to what is going on in the vast ether-ocean. Trust our very capable American youths to ferret out the senders of questionable signals or strangely worded messages. The very multitude of these amateurs is a priceless protection. Then again both our Army and Navy badly need Radio operators. What other country can furnish such a vast army of well trained and intelligent operators as ours, thanks to the amateurs? 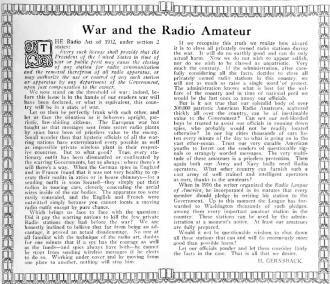 When in 1916 the writer organized the Radio League of America, he incorporated in its statutes that every member should pledge in writing his station to the Government. Up to this moment the League has forwarded to Washington thousands of such pledges, among them every important amateur station in the country. These stations can be used by the administration at a moment's notice. At least our amateurs are fully prepared. Would it not be questionable wisdom to shut down all these stations that can and will do enormously more good than possible harm? Let our officials ponder and let them consider fairly the facts in the case. That is all that we desire.